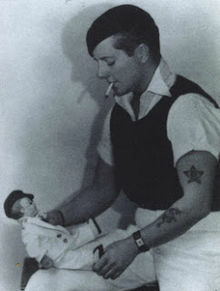 Encouraging blokes to unabashedly play with their dolls. Jesse: About 25 years ago, in the age of paper books, I read a story about a famous woman and her boy doll. I was totally taken with the story and I never forgot it. 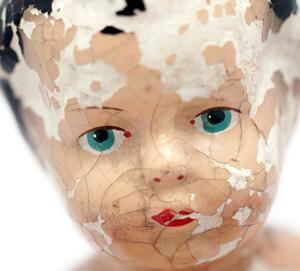 In fact, it was to have a huge influence on my doll play and collecting. Marion Barbara 'Joe' Carstairs (born 1900, died 18 December 1993) a wealthy British socialite known for her eccentric lifestyle, who became a famous power boat racer famous for her speed. Because of the huge fortune she had inherited as a young woman, Joe lived life large and fast. Her main interest for many years was racing powerboats and she become well-known as the "fastest woman on water". She was friends with Europe's famous and elite and took her lovers from amoung them. 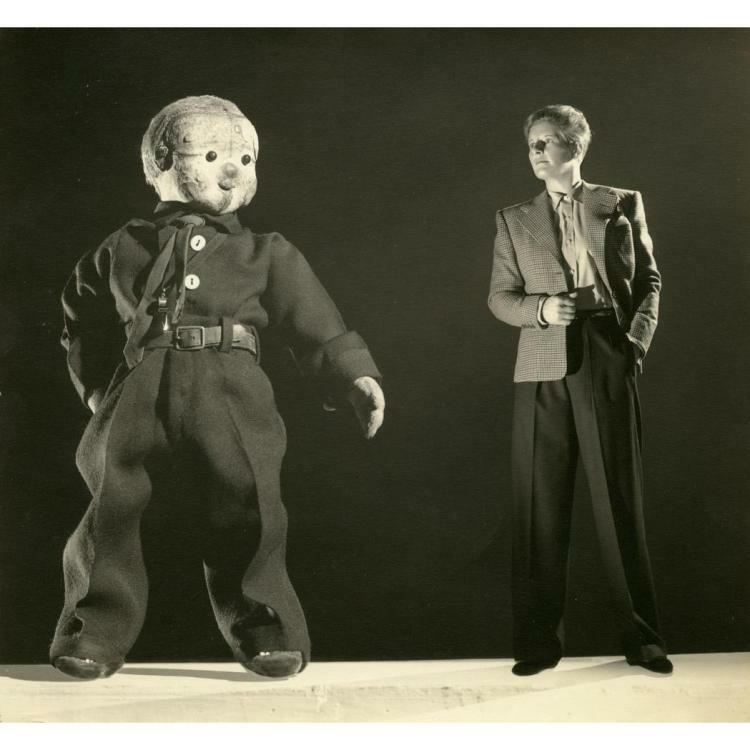 In 1924, her then-girlfriend, Ruth Baldwin, gave Joe a 12" leather Steiff boy doll whom she named Lord Tod Wadley. Although Joe and Ruth would not remain a couple for long (but did remain close friends), Lord Todd remained Joe's constant companion for the remainder of her life. She treated Wadley as her dearest friend and protected him from anyone who might possibly do him harm. She had expensive Saville Row monogrammed outfits made for him, tiny leather shoes from Italy, Cartier calling cards, stationary, golf clubs, jewellery, cowboy and sailor outfits, a monogrammed gold miniature cigarette case and lighter, a wristwatch that ticked, revolvers, a Bible, a dob, and his own dolls. She commissioned paintings, sketches and sculptures made of him. There were also the accessories such as furniture and the like which were used in the photo settings. Lord Tod was dressed and set in tableaux, then photographed and charming captions were added. Joe placed his name and hers on a plaque at the front door of her flat in Chelsea. Wadley was Joe's constant companion and he was never far away from her. However, he never raced on the boats with her for fear of losing him in an accident. Joe said, "He's me and I'm him. It's a marvellous thing. If everyone had a Wadley, there'd be less sadness in the world." In another place she confided, "I was never entirely honest to anyone, except to Wadley." This photo is from Doyle Auctions Lot 248 and shows some of the items from Cairstairs estate, auctioned 27 January 2016. 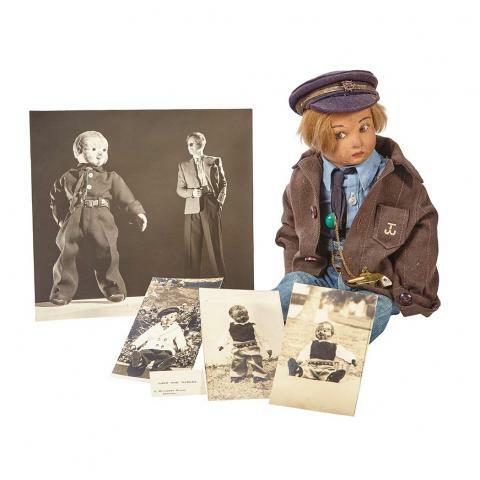 The doll is one of Joe's other dolls and is dressed in some of Lord Tod's clothes and accessories. There were other items in this auction but most are related to Lord Tod Wadley. The auction lot sold for $8,750 USD. This is a collaged photograph depicting Wadley in life-size next to a slightly smaller standing Carstairs. Lord Tod was with Carstairs to the end. When she died, the two were cremated together and were placed in a tomb by the sea. In 1955, Joe Carstairs wrote "The human touch is often disappointing ... I still maintain that friendship should be true and loyal and rare... so I've chosen one ... half doll half boy half real half toy My mascot Lord Tod Wadley." 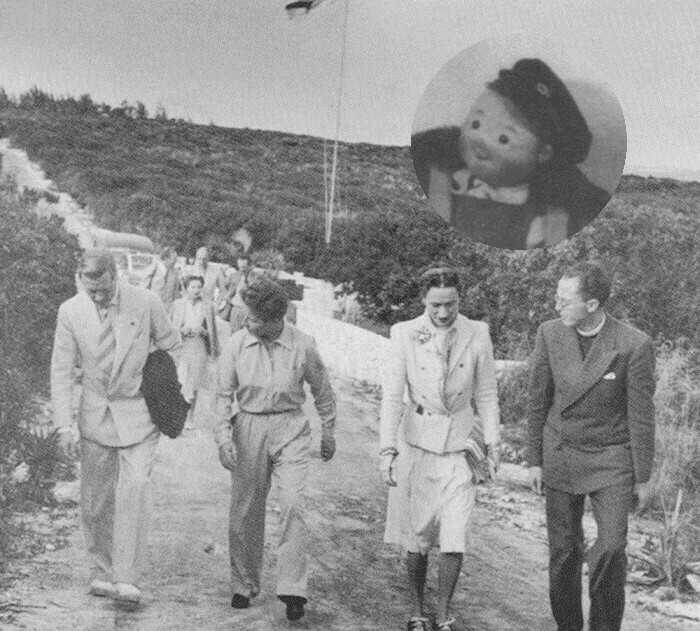 Joe Carstairs, with the Duke and Duchess of Windsor, on Whale Cay, January 1941. Inset; Lord Tod Wadley. Joe Carstairs was a bigger-than-life person with an amazing life story. I highly recommend to everyone the book The Queen of Whale Cay by Kate Summerscale. In it, there is not only a fascinating story but also some wonderful photos of Lord Tod Wadley. The book is available on Amazon both in paperback and Kindle editions. I have the latter in my library. Angelo: I think you'll enjoy this lovely poem by a man about his doll. Jesse: When I was a kid, I used to watch the Saturday morning cartoons, my favourite being Looney Tunes. 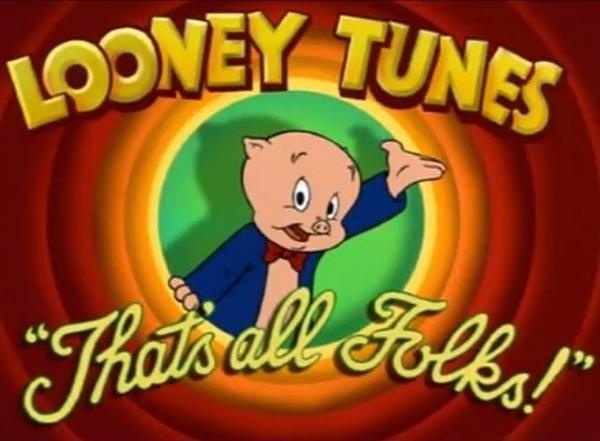 At the end of each programme, Porky Pig would stammer, "That's all folks!" marking the end of the best part of a Saturday morning. I thought it was an appropriate way to start the blog post as this is the last entry I'll make in this diary. Originally, I started this blog to showcase Adam and to counter the extremely negative comments I read on the internet about him. Angelo, who used to have his own PictureTrail account, is a regular ham and wanted his time again in the spotlight. The thing grew from there into what it is today. I'm Jesse, a guy who likes guy dolls – a variety of special boy dolls which I believe have quality features and a special allure. After a period of serious doll collecting, I pared my collection down to just one boy doll. 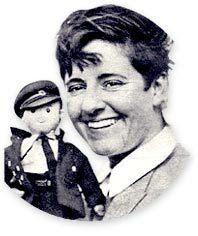 His name is Hans and he was made by Kathe Kruse in 1943 in Germany. I decided to start this page so I can share the life of this lad. Currently, I live in New Zealand with my husband, his vintage & antique stuffed animal collection and our 4 rescued dogs, the goats and chickens..